So you’re probably thinking, oh this just another article telling me to back out if I think I made a bad shot. Well… you’re wrong and right. This time you’re going to learn about the evidence your arrow leaves you, and how this is the most important information you have. I had a personal problem with doe that I double lung shot earlier in the season. It happened like this; I shot the doe perfectly broadside at 24 yards. The shot felt great however, I went in much to fast, just thirty minutes or so after I shot her. I found blood very quickly and very plentifully, I had tracked about eighty yards and I heard a deer jump up and take off running. I figured this was just another deer bedded down. I soon came upon a massive pool of blood and the blood stopped after that. I marked my spot on my phone and picked up the trail the next morning. I did not find blood for another eighty yards, and when I did it was very spotty. I soon began to lose the blood trail and after about one hundred it ceased completely. I searched for another couple of hours but I was never able to recover the deer. I do not want this situation to happen to anyone else, so I made this four part guide on how to track a deer with a bow. Gut shots… everyone’s biggest fear. The best way to tell if the remnants on your arrow are gut remnants is by smell checking. Sometimes a deer can be shot in the gut but still make contact with the liver making it seem as though you made a good shoot because you have blood on your arrow. Always smell your arrow, you will know if it is a gut shot because it will have a distinct stench. When you have gut shot a deer always mark where the deer was standing and back out for at least six hours before taking up the trail. Liver and/or muscle shots can be tricky to identify. Usually the arrow will be covered in super dark red blood. When you identify this you should wait at least four to five hours before taking up the blood trail. These are the ideal shots and they get the job done quick. They are typically light to medium red in blood color. The animal expires very quickly and suffers little to none. It is a good idea to wait at least one to two hours to track these deer just to be safe. The ideal shot for a hunter other than a heart shot is a lung shot. 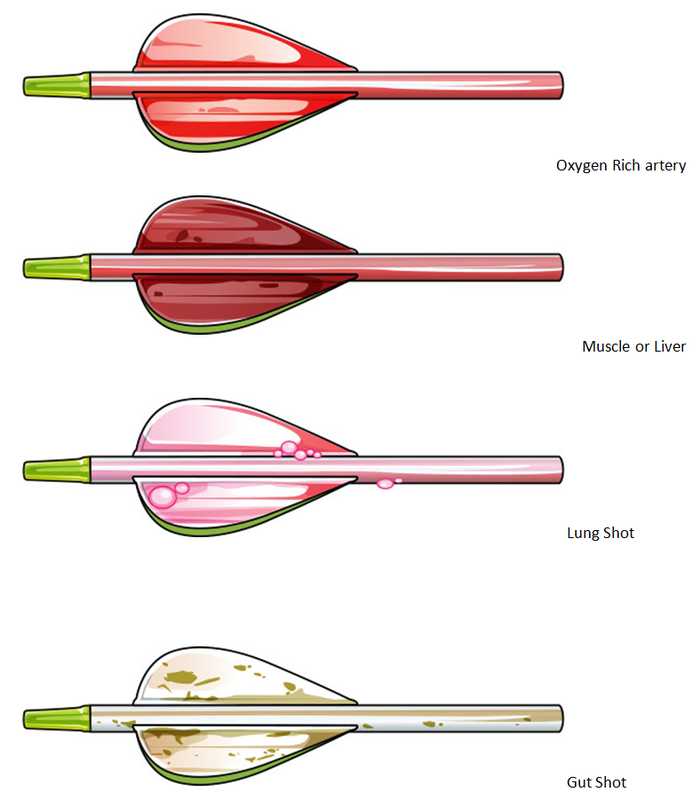 Arrows will typically be light colored blood with bubbles in it. These bubbles indicate the oxygen from the lungs. When dealing with a lung shot deer, it is best to wait at least one to two hours to track them. A personal preference in arrows is the Black Eagle Arrows’ Zombie Slayer. I hope this guide helps you and any of your friends who need tips on tracking deer. Good luck hunting! If you happen to live in a state that is fortunate enough to allow you to bait during black bear season then this is already a win for you. Hunting bears is an art and something I express almost all of my interest in when bear season comes around. My passion for whitetails is gone and it’s all about the bruins. There’s nothing more exhilarating than having bears coming in all day eating, playing, fighting, and sparring. I bow hunt northeast black bears from the ground over a bait station. Personally, I do it because it’s the highest adrenaline rush I have ever experienced and once you get the taste for that kind of adrenaline you can’t help but want more. In a stand you will see them all day long no problem. From the ground it becomes a chess match with the North East’s largest predator. Your scent game needs to be stronger than hunting the rut as I use a blend of dirt deodorizer and cedar. You best be a perfect shot because if you need to, you only get one shot at a bear with the bow. Now, for the most part the bear is much more afraid of you than you are of it and have nothing to worry about but it only takes one time to be the last time. Your safety should always come first. Your senses need to be at their peak and you need to be alert at all times. You need to use your hearing for behind you and your eyes for the front as movement is detrimental to a bear hunt. Whatever you choose to hunt from just don’t use a blind because they’ll tear them apart if they’re left out and will not bring larger bears in if you’re taking them in and out every day. Always respect the animal you’re hunting and never take them for granted. The key to a great bear stand is to find an area with cover as bears don’t like feeding in open areas. Find a place where bushes, deadfalls, and saplings are in abundance as they get a sense of security in these areas. Another important aspect is being near a source of water because feeding from your bait barrel will make them very thirsty and the closer to a good water source they are the more likely you will keep these bears around. Pick a tree that suits the spot you found to anchor your bait barrel to. There are a couple methods I’ve used in the past as far as the actual bait barrel goes. The one I like most is taking a 55 gallon barrel (I use the blue plastic ones) and cutting two holes near the top to have a place to string a ratchet strap through to hook around the tree. Then on adjacent sides cutting square holes out about 1/3 to ½ the way up the barrel. Large enough so they can get their paw in but not their head! This allows the bear to get the food without taking off with it leaving you with little to no pictures or opportunities for a harvest. The holes in the sides of the barrel allow the bear to line up a perfect broadside shot to your tree as you would face the uncut front side of the barrel directly at your tree stand. Now that set up is out of the way and you’ve got yourself one heck of a spot to start luring these beasts of North America in, it’s time to think about what to put in the barrel to keep them coming day after day. You want to bait early and often, you’ll get the hang of it after a couple weeks. Learning your area is key and it will teach you how often you need to refill your barrel. I always start baiting a month or two ahead of the season so it gets your bears in a routine. Now depending what your season is will be how you determine what to put in your barrel. My season here in NJ is a week in October (Bow) and a week in December (Shotgun). So during the October season you can put just about anything in there, sweets, protein, fats etc. as everyone knows, bears will eat just about anything. Now when the December season comes around or if yours is November like Pennsylvania’s is even though they can’t bait, then protein and fats are your best friends. They need to bulk up and add a ton of weight heading into winter and will absolutely empty your barrel in three days if you have a decent amount of bears in the area (10-15). That’s when you fill that barrel as high as possible with dog food, bird seed or any protein you can think of. Get a good fryer grease hookup and douse that barrel with 5 gallons of used fryer grease. Spread it all over, inside, outside, on the ground, on the tree, everywhere! The grease acts as a high distance attractant, much needed fat for the bear and as they roll and eat through the food they get covered in grease and track it through the woods for any bear to come across the tracks and follow it to your barrel. This method has worked for my dad, my uncle, myself and many others in our neck of the woods in North West New Jersey. For those of you that have spring bear hunts you want to focus on the sweets as too much fat and protein will irritate their stomach and digestive tract coming out of winter hibernation. A buddy of mine in Maine uses Oreos, marshmallows, chocolate syrup, and any type of sweet he can get a hold of in bunches from his bait dealer up there. Fluff is his main stay as whoever he works with can get gallons on gallons of expired fluff. Once the barrel has been filled, stuff the access holes with sticks and logs, it’ll keep the raccoons, opossums, ravens, and crows out of it and will let you know when there’s something hitting it. So whenever your season is and whatever stand you prefer, these methods will give you a great, if not the best chance to take the bear of a lifetime. P.S. For those of you that are not allowed to use bait during the season, Signal 11 Peanut Butter Spray is a bear attractant godsend.